Sometimes, no matter what information you’re given – even if you’re able to have a taster – perceptions can be incorrect. No game better exemplifies this to me than Darksiders III. It was only just under two months ago that I previewed Darksiders III and my impressions were certainly on the positive side of things. That much hasn’t changed. However, certain thoughts in my preview could certainly give off the wrong impression so now’s when I set it right. So, now I’ve spoiled my overall impressions of the game, those being positive, let’s talk about why I like Darksiders III and also some aspects that may not be as good as they could be. In my preview, I made a few comparisons to Dark Souls. I’ll continue making some of these links but I’m going to be a little more exact, it’s not so much borrowed from Dark Souls than Demon’s Souls. 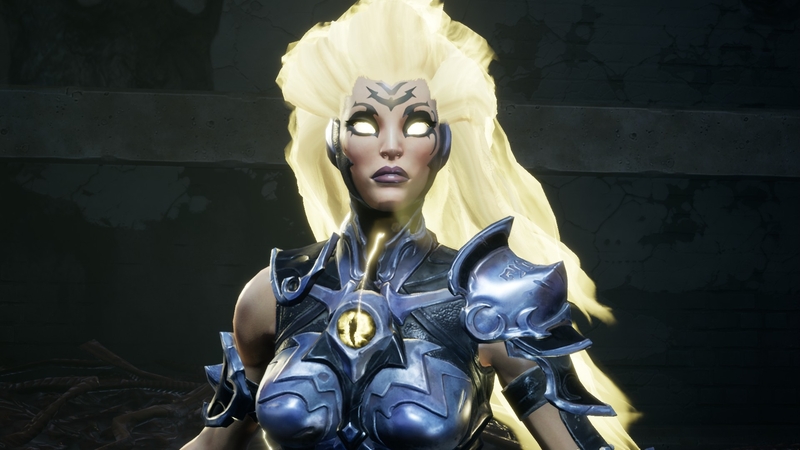 Interconnectivity is a word that I wanted to use just for the sake of using it but also one that I originally thought I’d be using to describe the world of Darksiders III. This isn’t so much the case of the world being interconnected to itself at multiple parts, more that each area is connected to a single hub, with maybe a few connections between areas, though I haven’t honestly found many. The world here is all connected around a single area called Haven – this also has the single friendly area in the game where you are able to upgrade your weapons and enchantments, more on those later. What you’ll find yourself doing is going down a path that may seem like it diverts a lot, but is mostly linear with a few exploratory offshoots that let you pick up a few items. As you reach other areas, activating checkpoints and serpent gates (the in-game transport network) as you go. What I like is the seeming lack of window dressing. If you see something on the horizon, you’re probably going to find yourself there soon. You’ll also be able to unlock gates and passages, which cuts out a lot of backtracking. You’ll definitely need it as well. One of the ways that Darksiders III: manages your progress is through the hollows you receive. Each of these four hollows has a special ability that inevitably prevents you from accessing an area. Or at least to an extent, because the linearity doesn’t seem to apply to the order in which you kill the seven deadly sins. Again, for the most part. You’ll also find yourself visiting older areas once you’ve unlocked later powers. These paths from the hub all seem to have at least two ways of traversing them. Maybe you’re using the Storm Hollow, which lets you float and use wind currents to carry you further than you expected. Instead, maybe you want to use the force hollow to smash open blocked areas, walk on the bottom of a lake or turn into a ball that sticks to magnetic surfaces. The Flame hollow allows you to jump considerably higher as you propel yourself like the human torch. Finally, the stasis hollow lets you freeze objects in motion, walk on water or hold onto very specific surfaces. Each and every one of these hollows will be essential in solving some of the games more obfuscating of puzzles. When I say that I’ve genuinely found myself getting frustrated and often thinking I must have been getting a little stupid thanks to games often hand-holding. Then I realised that no, I wasn’t – I eventually solved these puzzles – but it was pretty much always through trial and error as the game offers little or no guidance. To take a quick shot of a recent conversation with our very own Alessio. That’s the real issue with Darksiders III. Too many issues are solved through frustration, through trying something, trying a different thing, keep trying and try again a bit more. Eventually, you may get lucky enough to get past one of the more convoluted of puzzles. Or, I should actually be a little more precise. Not all of the puzzles are bad in the fact that you have to try random things to work out what to do. Some of them are just incredibly challenging and require an almost inhuman level of precision. One example, which cost me around ten deaths – though managed to get me a large number of souls from the repeated killing of the same enemies – was where I had to use stasis to freeze some rock crushers before they crushed a rock which I would then use as a platform to jump over a surprisingly large gap. The problem is, the amount of time you’re given is all too short. There are quite a few of these time-related puzzles that simply don’t give enough leeway. At least customisation and combat doesn’t require the same level of you slamming your head a wall. Well, for the most part. The customisation is the easy part and can truly help you during combat. One of the major reasons to explore the offshoots of the game is to collect Angel and Devil Artifacts. These can then be used to upgrade Enchantments which will then be added to one of your many weapons. In general, the primary weapon will be your chain whip, so your best Enchantment wants to be on there. Mine, the Leviathan, helped me with a good amount of regenerating life. It let me win a few fights through simply dodging the enemy until I had the health to attack. The other method of customisation is through levelling up using the collected souls. Each level gives you a point to add to health, base attack damage or arcane damage. This was effectively my move for the more difficult battles. These difficult ones being every single battle in the bloody game. Okay, I exaggerate, though not too much. One thing that is certain here is that while the combat is incredibly fluid and hard-hitting, it’s challenging. Enemies are very difficult to interrupt no matter how hard you hit them, though they find it easy to interrupt you. The more basic of foes can be taken down relatively easily, but each type of foe has its stages. Some, effectively sub-bosses, are a challenge in themselves. All of these challenges, from hordes of regular enemies to these sub-bosses to the deadly sins themselves are all combatted the same way: learn their attack pattern, dodge at the right time, counter-attack. Use your fury and havoc attacks when the bars are full for some fairly effective damage. Rinse and repeat. The real challenge comes with the fact that dodging has to be pretty damn precise. All too frequently I found myself dodging too early, not able to counter-attack and leaving myself open to a follow-up strike. When you manage to dodge at the right time, the counterstrike is powerful and incredibly satisfying. It’s genuinely one of the more satisfying points I’ve found in most games of 2018. There’s a sense of pride to be gained because it required a good amount of precision throughout. Each of the four hollows has a different type of attack with their own benefits. My personal favourite has been the storm hollow which you can abuse the game a little by using the jump attack, staying out of enemy reach and blasting your lance down creating a bolt of electricity. Darksiders III isn’t without its bugs, that much is certain. On a few occasions, I’ve encountered the game going through a horrible phase of loading after every single step during a busy area. In addition to this, I’ve had a few moments where the world itself hasn’t actually loaded. I’ve literally walked through buildings, stepped into the void and fallen into the white nothingness. I could have assumed, but I’d only be fooling myself. It seems most of these, as well as an issue with the frame rate dipping, came after prolonged play. After a four to five hour stretch, the game can be hogging up over 5gb of RAM. It’s here when the aforementioned bugs start to creep in and the game can start to stutter and textures improperly load. These issues were remedied by a quick restart of the game. I can also forgive some minor issues. The one thing I can’t forgive, however, is the issue following (what I assume) is the final boss. Following this fight you have two cutscenes, seemingly wrapping up the story. However, Darksiders III then loads with the implication that there’s something else to come. I’ll never know though. I’ve defeated that boss six times now. Each and every time, following the second cutscene, a permanent load screen. It’s especially gutting for me because I’ve genuinely enjoyed the story and I actually want to know how it finishes. Aside from the issue of textures loading I don’t have a real issue with the aesthetics, though that isn’t a resounding endorsement. You often find yourself in relatively bland areas. Dilapidated, ruined cities, Subway tunnels and caves overrun by horrible insectoid creatures or even a flooded industrial port. Few areas are inspiring to look at, but they serve the purpose of telling the simple story that this is the apocalypse. It makes sense that you’ll be going through wrecked areas of humanity. At least the combat is attractive and flashy. A forest would have been nice though. On the audio front, the result is a mixed bag. Combat, as well as feeling heavy and powerful, sounds it. The demons you encounter sound fierce, the static of electricity as you fire down your lance while using the storm hollow, the sounds of flames on an oil spill that you’ve set on fire. It’s all engaging and helps to draw you into the world. What doesn’t, though, is the voice acting. In itself, it’s not too bad, but the script is terribly cheesy. With a more challenging and engaging combat system, especially thanks to the availability of different hollows, combined with a genuinely compelling story, Darksiders III has certainly wormed itself into my good books. You genuinely feel like you’re controlling one of the four horsemen of the apocalypse and you have the power at hand to lay waste of any who oppose. It’s especially so when you get the hang of the combat. While it’s not perfect by any means, it’s a true sign that genuinely fun and interesting games can be made. Especially ones that don’t have a huge monster-budget that needs to sell a copy to every single person, and their pets in the world to break even. Though I do question the fact that they’re charging the full £45/$60 for what THQ Nordic have openly admitted isn’t a huge budget title, this will sadly limit the number of impulse buyers. Despite any flaws or niggling annoyances, I’ve genuinely found myself enjoying Darksiders III more than the previous games. I can certainly recommend the game because it really is fun. Is that fun worth paying the same price as any other premium, big-budget game? That’s for you to decide. PC version reviewed. Copy provided by the publisher. Darksiders III is a fun game with an engaging combat system that can be very satisfying, particularly thanks to the dodge and counterattack system in place. All of this is surrounded by a surprisingly compelling storyline with interesting characters. There are issues in the game, with a few bugs and other technical problems as well as a pretty damn cheesy script, with the biggest issue being some downright irritating puzzle sections which are less about logically working something out than slamming your head into a wall repeatedly until something gives. Despite any issues, I've genuinely found myself enjoying my time in the apocalypse. Interesting story and characters that can draw you in. Strong, compelling combat system, particularly during the boss fights. Good enemy design that makes foes feel different and challenging during combat. Bugs can often occur on any prolonged session on the PC. Most areas are fairly bland and uninteresting.